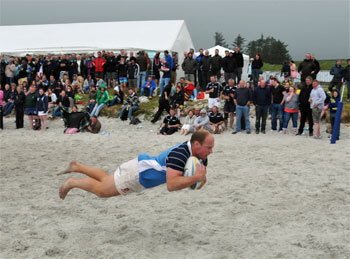 The first big event was of course the Islay beach rugby on the first weekend. After a great stay at the excellent The Bowmore House with a warm welcome to Islay by Andrew on Friday evening I headed out to Port Ellen on Saturday. After initial clouds the sun soon broke through for some nice sunshine, unfortunately later the haar moved in and it turned fairly cold. This didn't stop the enjoyment though, and a lot of good rugby was shown. I saw several familiar faces from previous tournaments and got to talk to a few new people. Of course I took quite a few pictures, over a thousand actually. I've already reduced them down, but will still have to do a lot of editing. I'm hoping to add a gallery with the best to my Islay Beach Rugby page by the end of the week (and at some point catch up with the 2011 pictures). For the rest of the two weeks my base was at Kilchoman House Cottages as usual. Again Ian and Margaret made it a great stay, I also got to talk with many of the other guests. The weather was a mixture of brilliant sunshine and torrential rain, luckily I was able to schedule most of my walks and other outings around the sunshine. I revisited the southern skerries as planned, but decided against visits to the waterfalls, as there simply wasn't any water in them until some torrential rain on the last Friday. 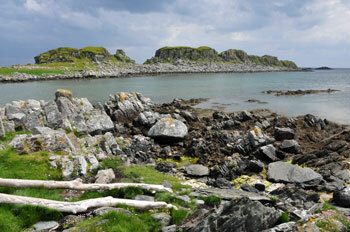 Instead I finally visited Soldiers Rock and revisited the steep cliffs to the west of Sanaigmore. Not to forget many hours on the western beaches. I met several old friends for good chats, got to meet new people, visited some of the distilleries and generally relaxed in front of the open fire in the cottage. 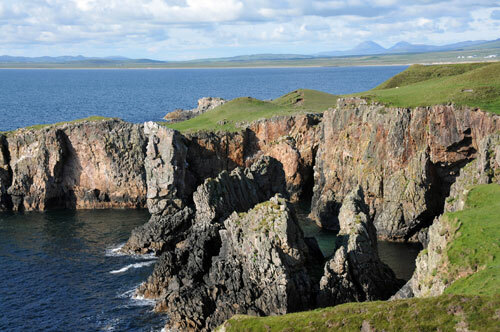 For today I'm going to leave you with a view of Soldiers Rock and the Paps of Jura, more to come here and on the Islay Pictures photoblog over the next few days and weeks.